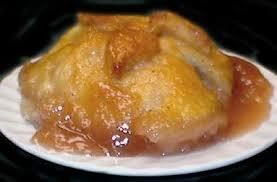 To fully enjoy this break in the music, prepare in advance a pan of warm apple dumplings. Make the Pastry Dough: In a large bowl, whisk together the flour and salt. Using a pastry blender or two knives, cut in the shortening until the mixture is crumbly. Gradually add the ice water, tossing the mixture with a fork, until the dough forms a cohesive mass. Divide the dough into eight equal portions, wrap each in plastic wrap and refrigerate for at least 30 minutes. Preheat oven to 350 degrees F. In a small bowl, stir together the granulated sugar and cinnamon; set aside. Assemble the Apples: Roll each portion of dough on a lightly floured work surface into a 7-inch square. Place an apple in the center of each square. Place 1 teaspoon of butter and 1 teaspoon of the cinnamon-sugar mixture in the center of each apple. Gently bring up the corners of the pastry to the center of each apple; pinch the edges to seal. Place the pastry-encased apples in a greased 9×13-inch baking dish. Sprinkle with the remaining cinnamon-sugar mixture. Make the Sauce: In a large saucepan, combine the brown sugar, water and butter over medium-high heat until it just begins to boil, stirring occasionally. Pour the sauce evenly over the apples. Bake for 50 to 55 minutes or until the apples are tender and the pastry is golden brown, basting occasionally with the sauce. These are best served warm immediately after baking.